"Speed is everything. It is the indispensable ingredient in competitiveness." Getting simple in business helps people work smarter and navigate infinite choices. By simplifying complex procedures and establishing simple idea evaluation and decision making techniques, you are making it easier for people make decisions faster and implement these decisions with speed. 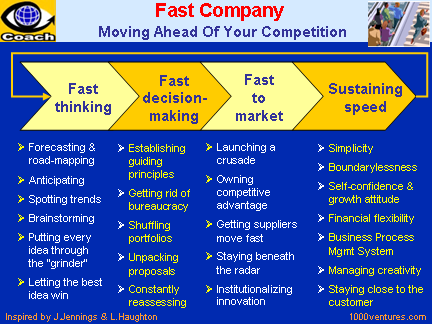 'Fast is better than slow,' says one of the Google's 10 Guiding Principles. Google launches early and often in small beta tests before releasing new features widely.